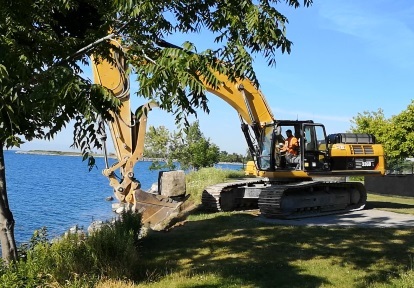 Toronto and Region Conservation Authority (TRCA), in partnership with the City of Toronto, is undertaking maintenance works on existing shoreline erosion control structures along Lake Ontario within Rotary Peace Park in order to protect against the hazards of shoreline erosion and address public safety concerns. 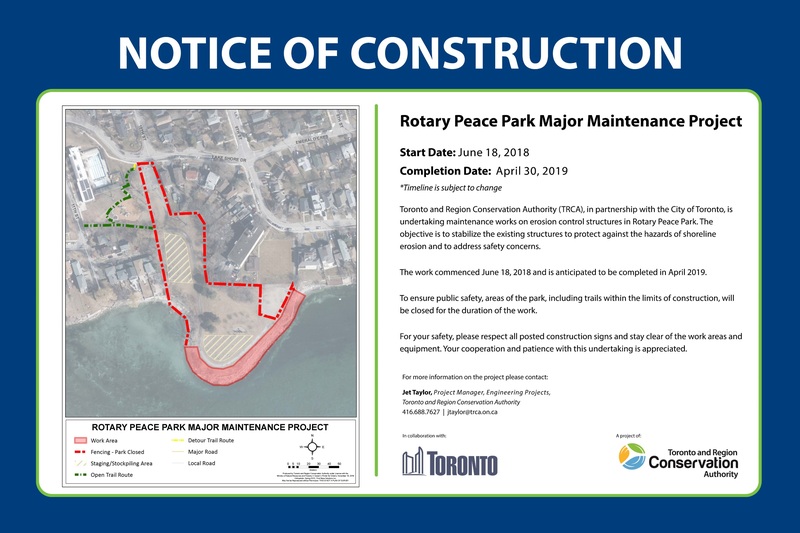 The project area is located in Rotary Peace Park at 25 Eleventh Street, south of Lake Shore Drive, in Etobicoke, City of Toronto. 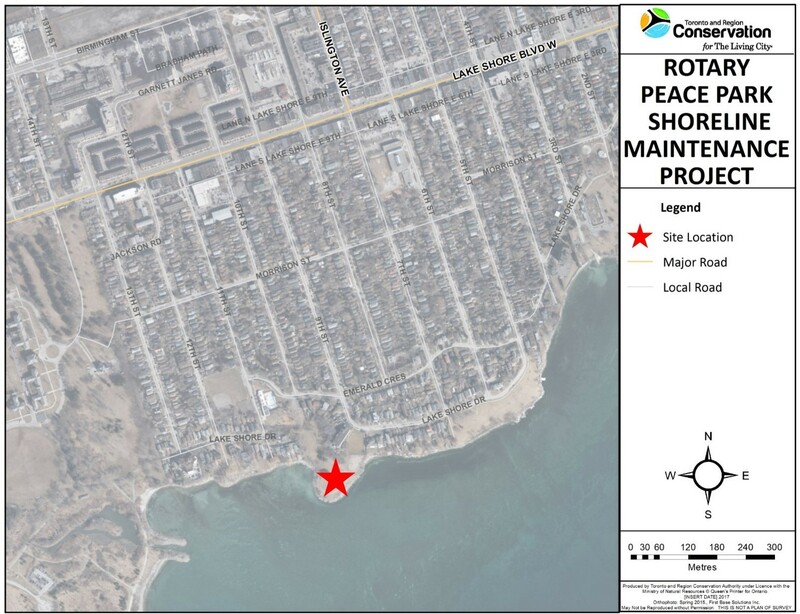 The area of concern is located at the southern end of Rotary Peace Park, on the north shore of Lake Ontario. 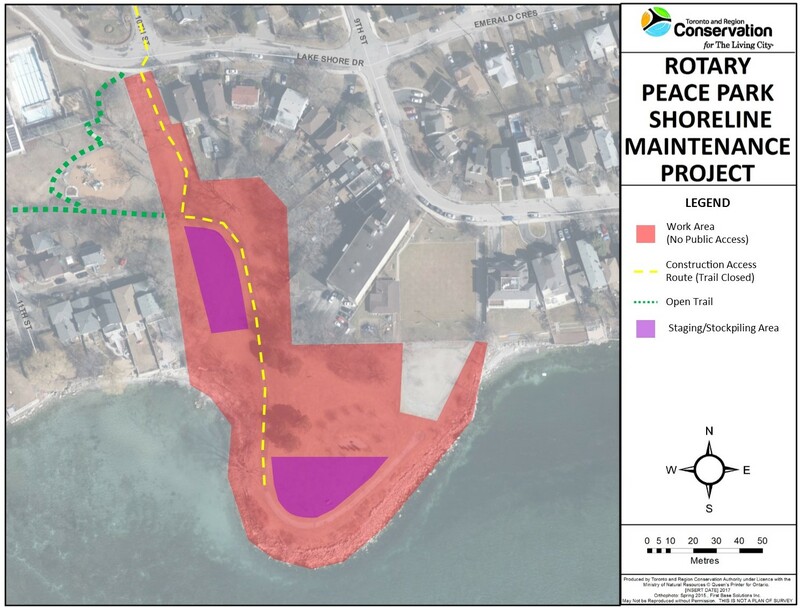 Location of Rotary Peace Park Shoreline Maintenance Project. Source: TRCA, 2018. Aerial view of Rotary Peace Park. Source: TRCA, 2017. 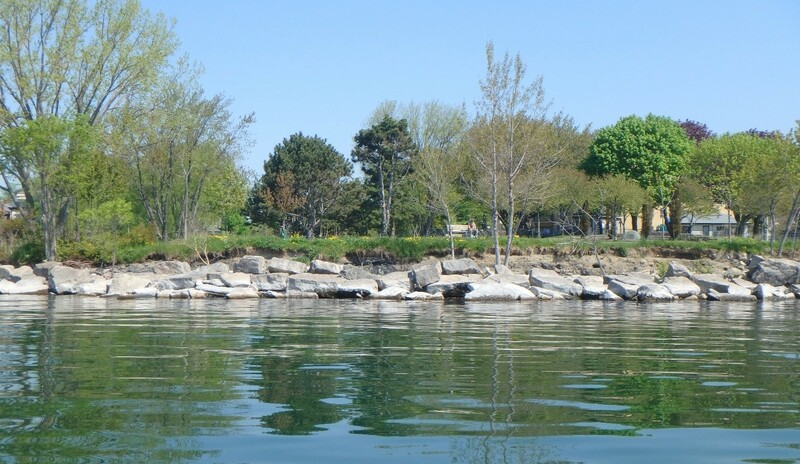 The shoreline landform of Rotary Peace Park was built as a fill extension in the mid-1960s and includes an armourstone headland for erosion control protection. 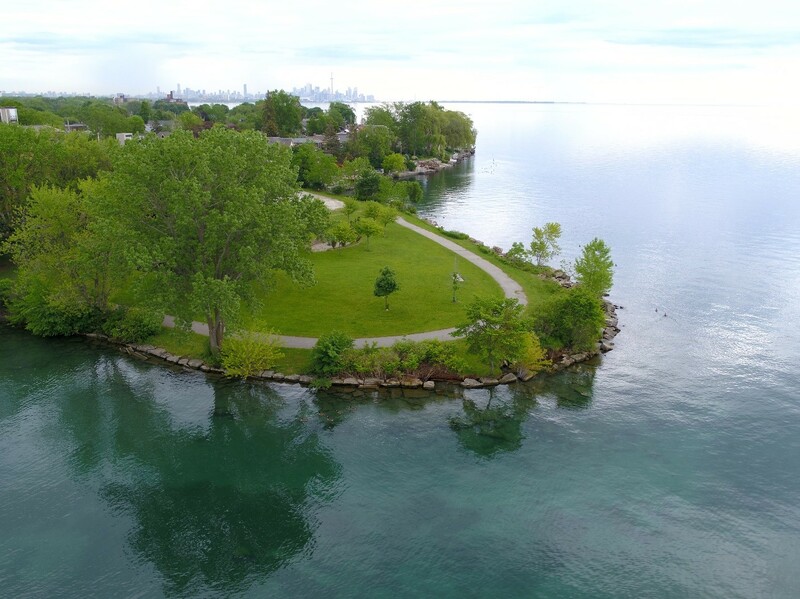 The landform has been used as a public park since its construction, and features a formal walking trail, benches, and open green space that overlooks Lake Ontario. 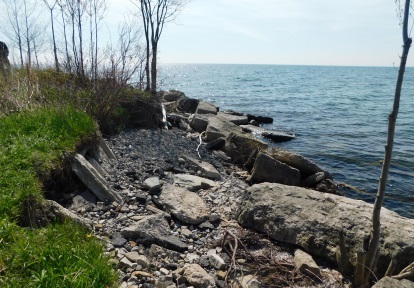 In 2006, TRCA began conducting annual inspections of the headland structure as a part of the Erosion Risk Management Program (ERMP). 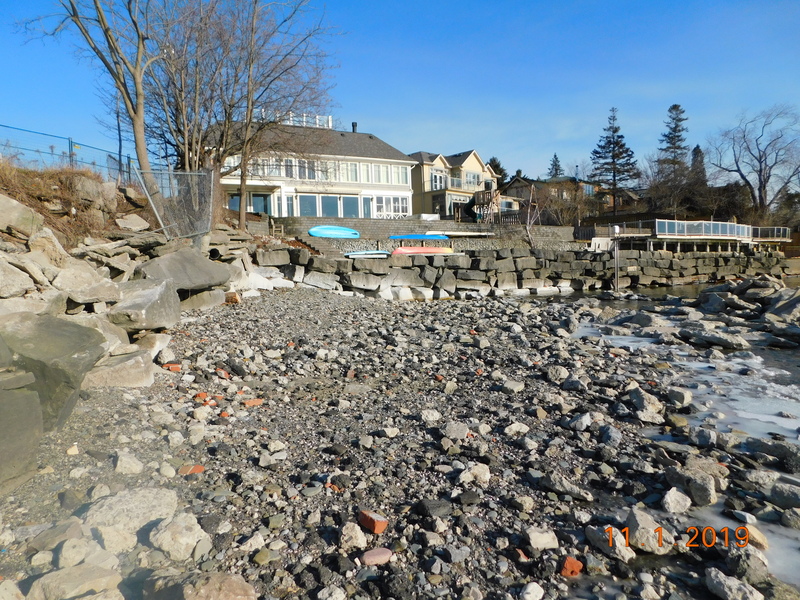 The 2006 inspection identified exposed geotextile with major displacement and voids of armourstone within the shoreline revetment. The ERMP has assessed the structure as failing since this initial inspection and has ranked it as a high priority for maintenance since 2010. 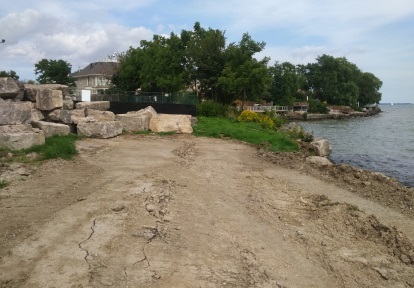 Subsequent inspections have identified ongoing deterioration of the structure, including significant scouring behind the upper tiers of the armourstone wall and slumping of the revetment into the lake. 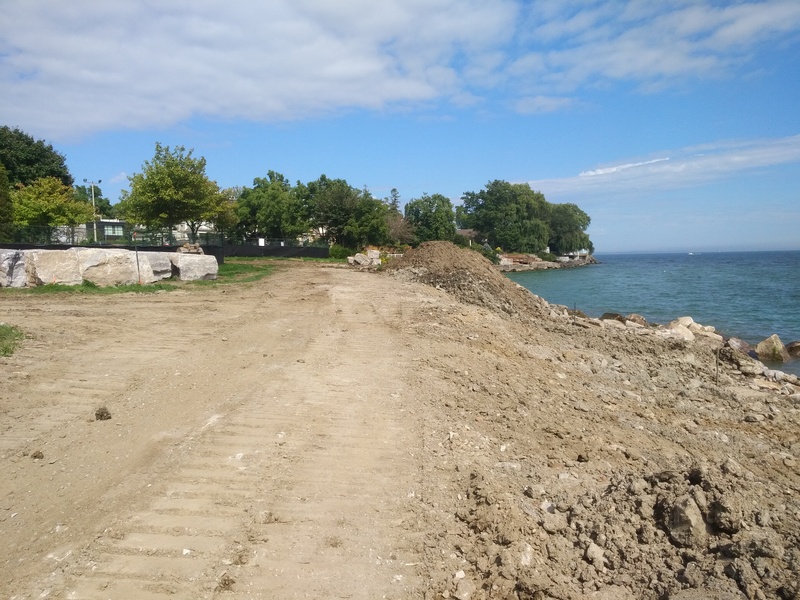 In the Spring of 2017, Lake Ontario experienced record high water levels which further exacerbated deterioration of the headland, increasing upland erosion and placing the formal park trail at-risk. 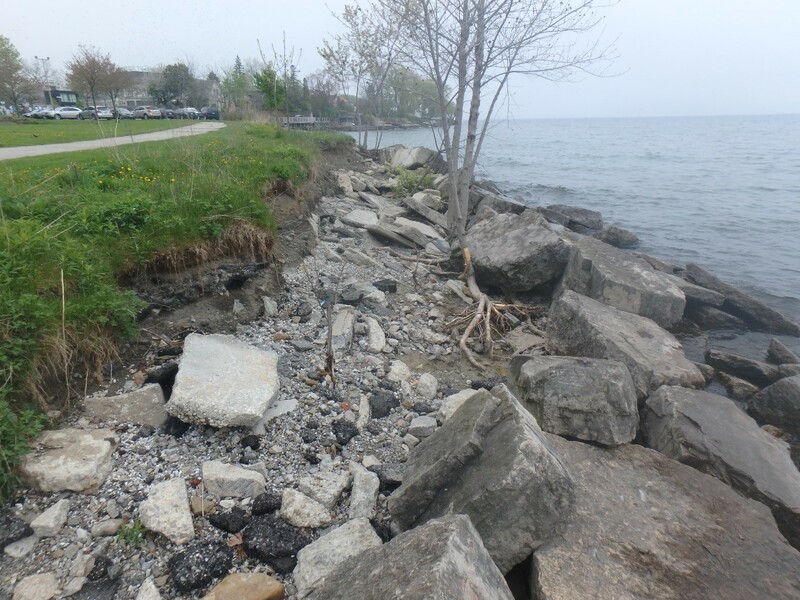 Record high water level of Lake Ontario in June 2017, causing further erosion of the Rotary Peace Park headland. Source: TRCA, 2017. 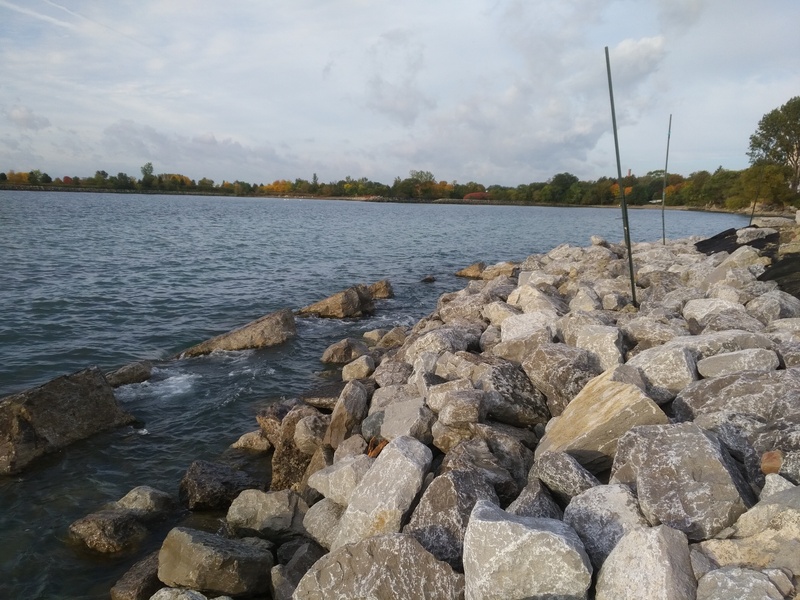 Condition of shoreline showing backshore scouring and irregular armourstone profile. Source: TRCA, 2018. Scouring behind length of structure, putting park trail at-risk from erosion. Source: TRCA, 2018. 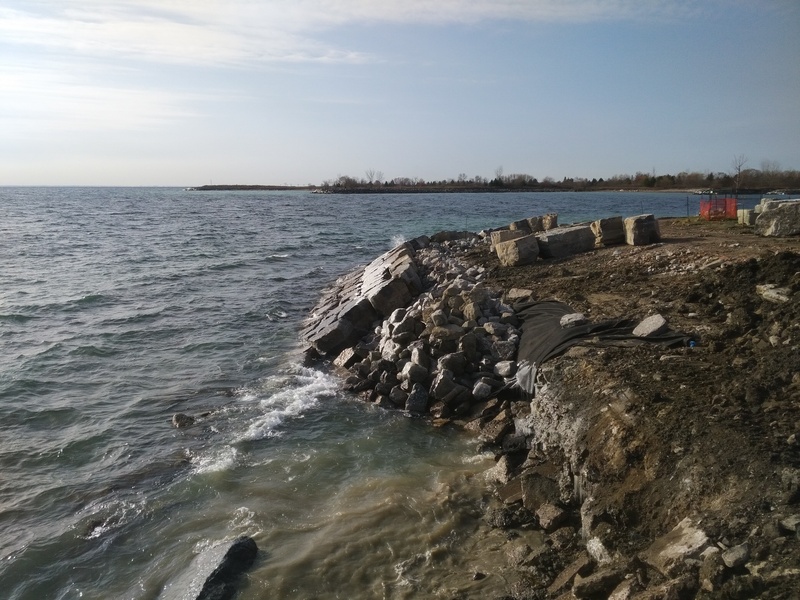 In 2013, TRCA retained Shoreplan Engineering Limited to develop a detailed design for repair of Rotary Peace Park’s shoreline armouring in order to address ongoing erosion concerns. 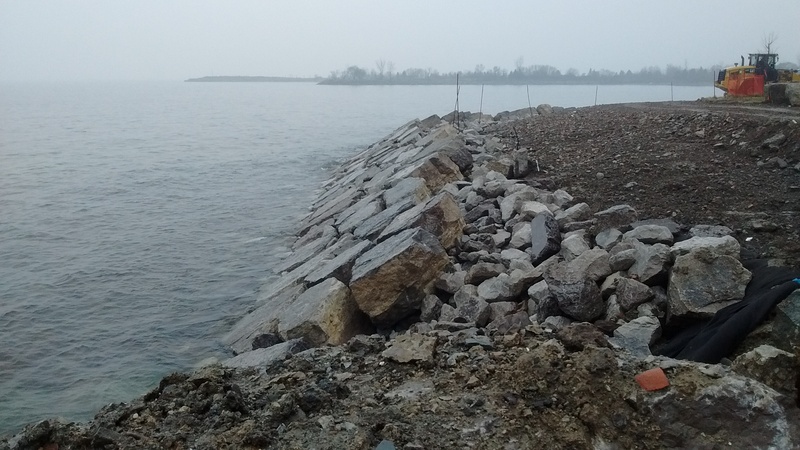 The design includes reconstruction of the shoreline armouring using both original and additional new rock material, as well as the installation of a vegetated drainage swale to improve tableland drainage. 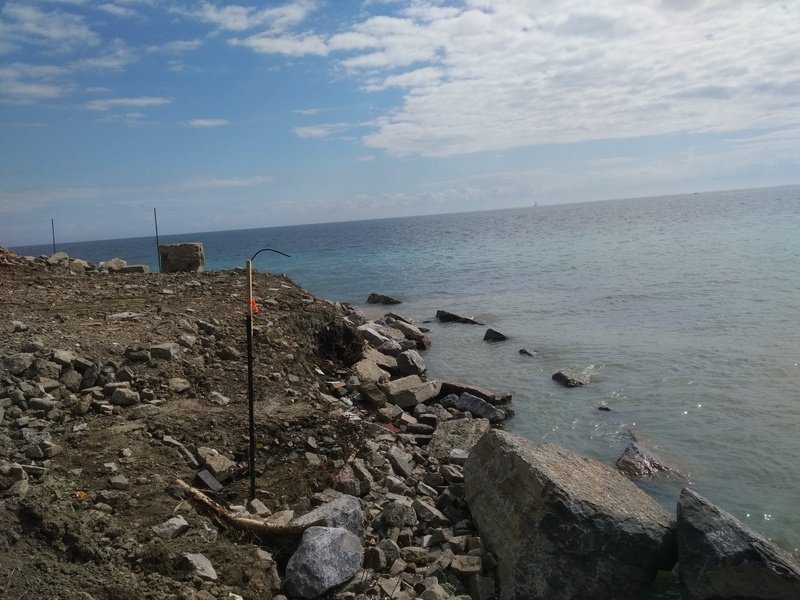 Construction is scheduled to commence June 18, 2018 pending the receipt of all required permits and approvals, and is anticipated to be completed by the end of April 2019. Please note, to ensure public safety, a portion of the park, including trails within the limits of construction, will be closed to the public for the duration of the work. 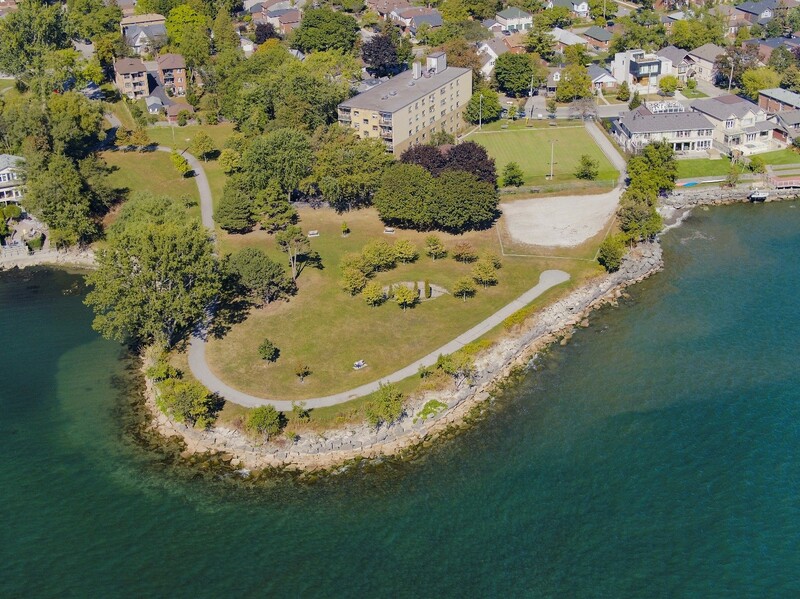 Amenities including the swimming pool, playground, and lawn bowling field are located outside of the work limits and will remain open. Please see the map below for details. 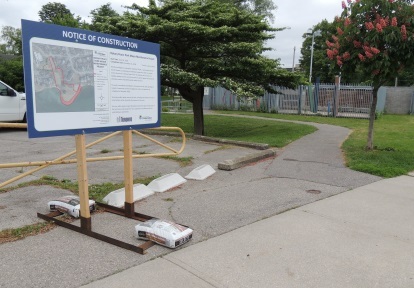 Location of construction activities at Rotary Peace Park. Source: TRCA, 2018. The following Notice of Construction sign has been posted at all park and trail entrance locations. 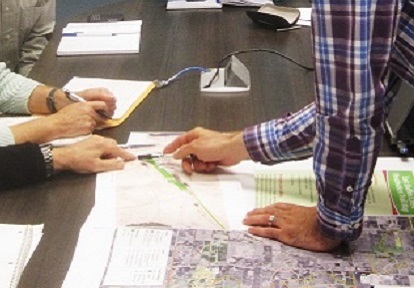 In addition, notice letters were delivered to surrounding residences and businesses within the project vicinity. Site setup and fence installation has begun. 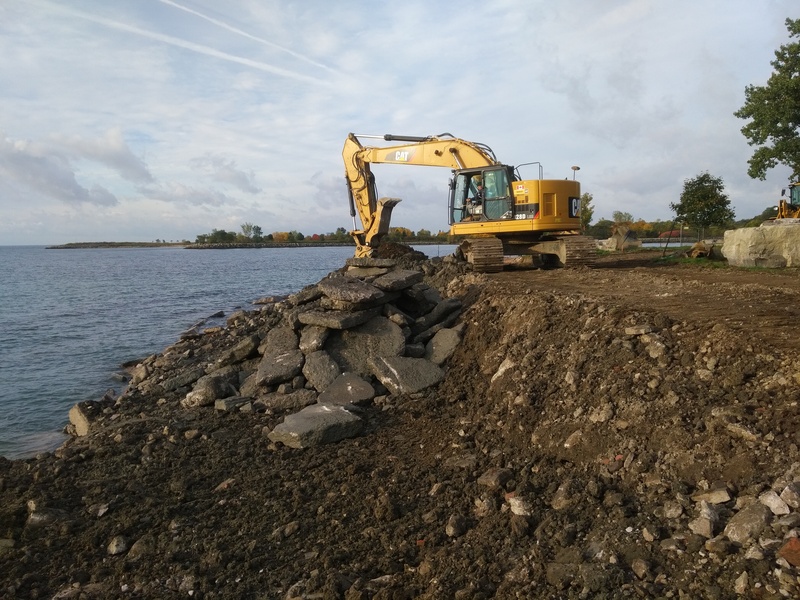 Once setup is complete, construction of the revetment will begin. Installation of fencing at Rotary Peace Park. Source: TRCA, 2018. 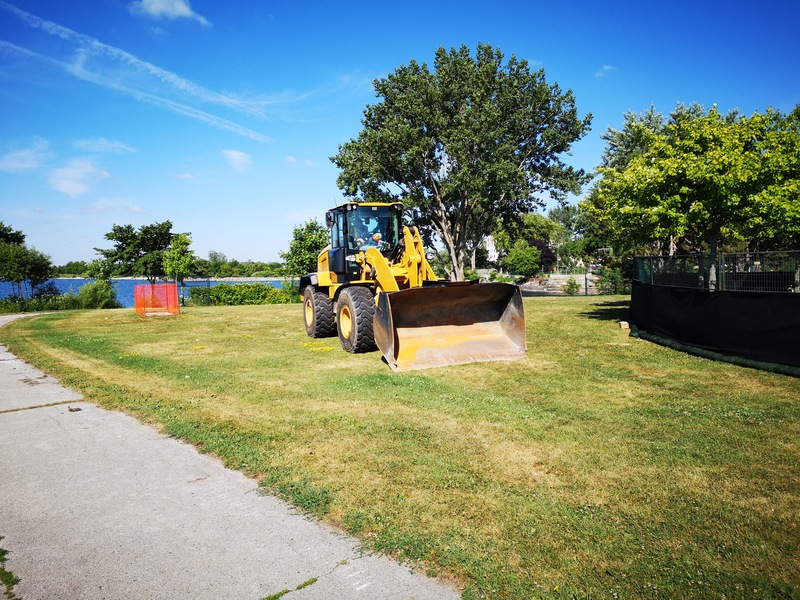 Fencing and construction equipment at Rotary Peace Park. Source: TRCA, 2018. 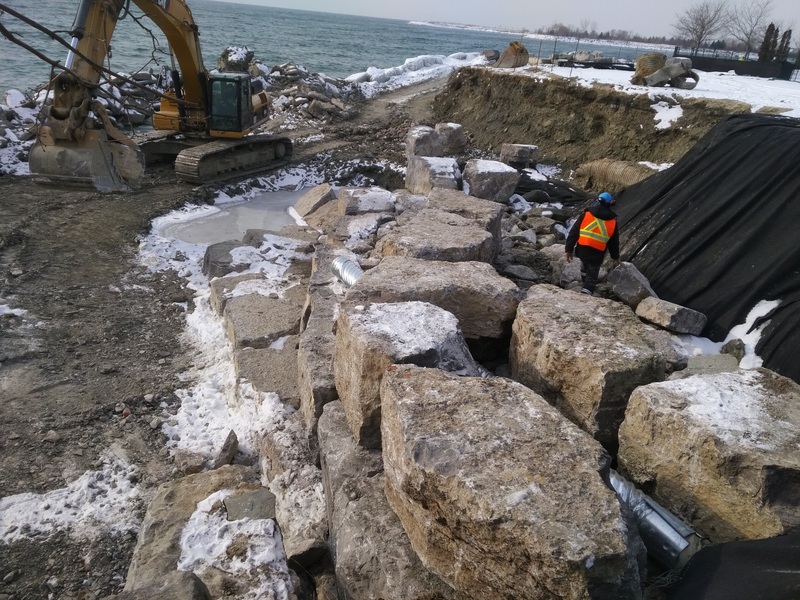 Crews have begun dismantling the existing revetment and stockpiling armourstone and other material that can be reused. Excavation and stockpiling of existing armourstone. Source: TRCA, 2018. Crews have dismantled the existing revetment and salvaged reusable materials. In-water works are in progress, with many stones having been placed below the water line. Armour stones being placed below the water line. Source: TRCA, 2018. 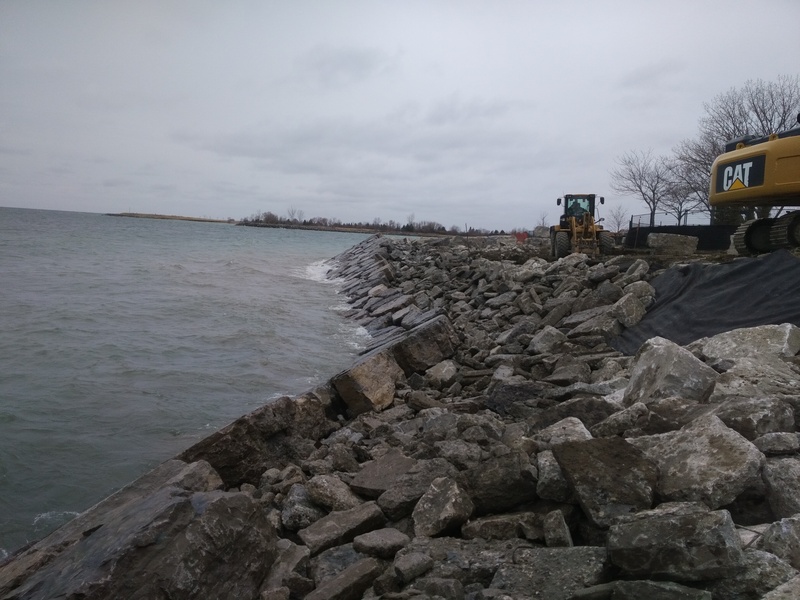 Crews have begun to place material above the waterline that will provide a base for the final armourstone revetment. Some material has been salvaged from the existing structure and reused, while other new material has been brought in. Salvage and reuse of concrete material that was part of the original erosion control structure. Source: TRCA, 2018. Rip Rap material placed on the shoreline. Source: TRCA, 2018. 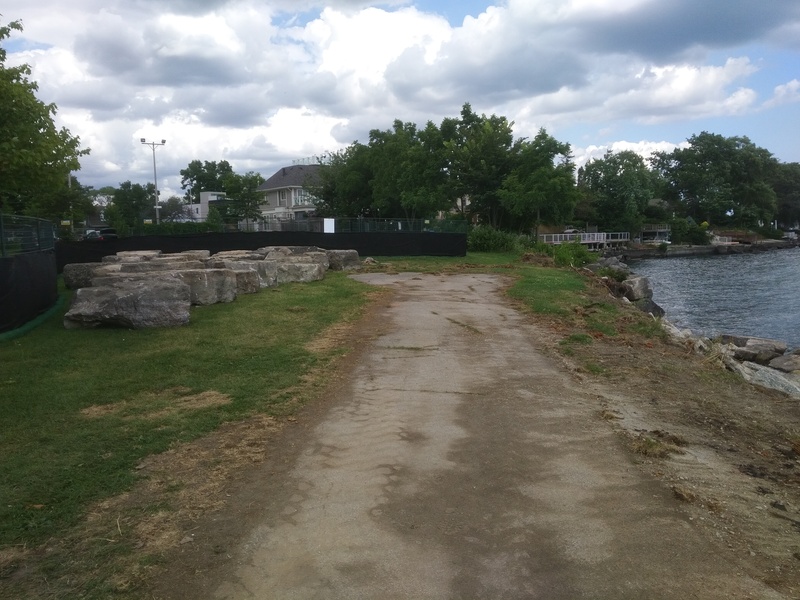 Armourstone is being placed along the shoreline on top of the established base stone. Stacking of armourstone over the base stone. Source: TRCA, 2018. Continued placement of base stone and armourstone top layer. Construction progress, placing base stone and armourstone. Source: TRCA, 2018. Armourstone placement continues and an access road has been established to complete works on the east side and around the nearby private property. 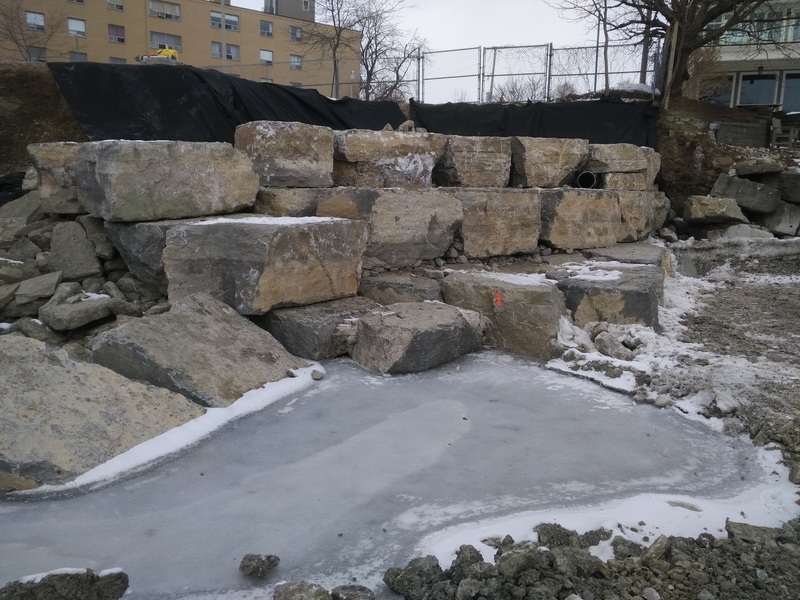 Progress of armourstone installation at Rotary Peace Park. Source: TRCA, 2019. Two City of Toronto stormwater drainage pipes are present in the park. 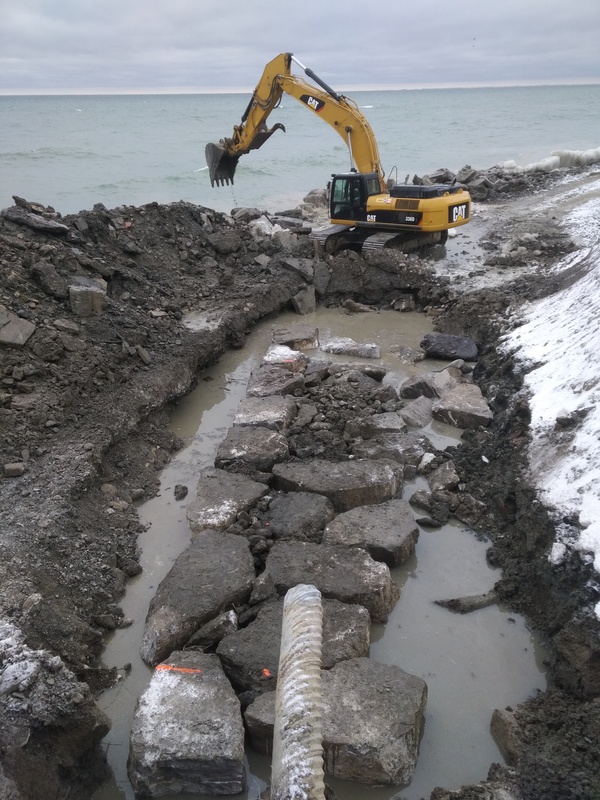 The east pipe has been excavated and will be fitted with an extension and integrated into the shoreline protection. The exposed stormwater drainpipe has been fitted with a new pipe extension. 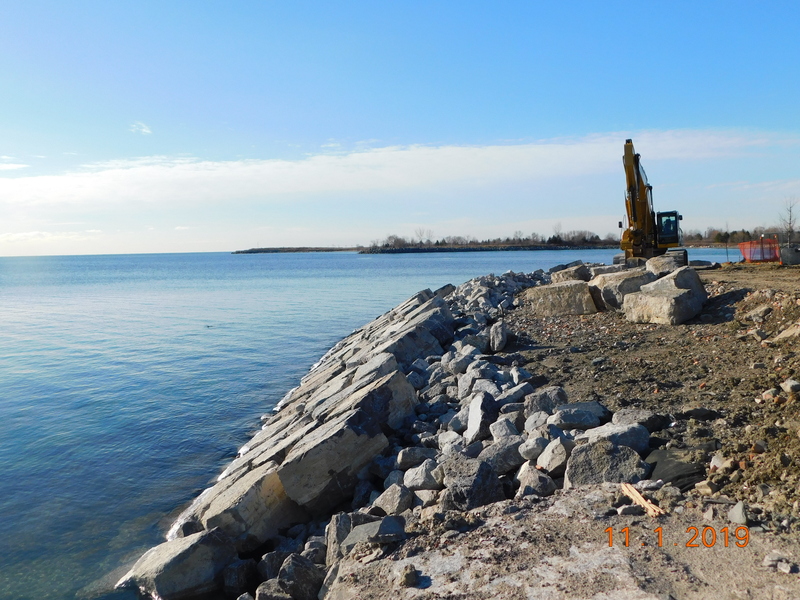 The pipe is being integrated into the armourstone shoreline protection. The second pipe has been excavated and the broken portions have been removed. 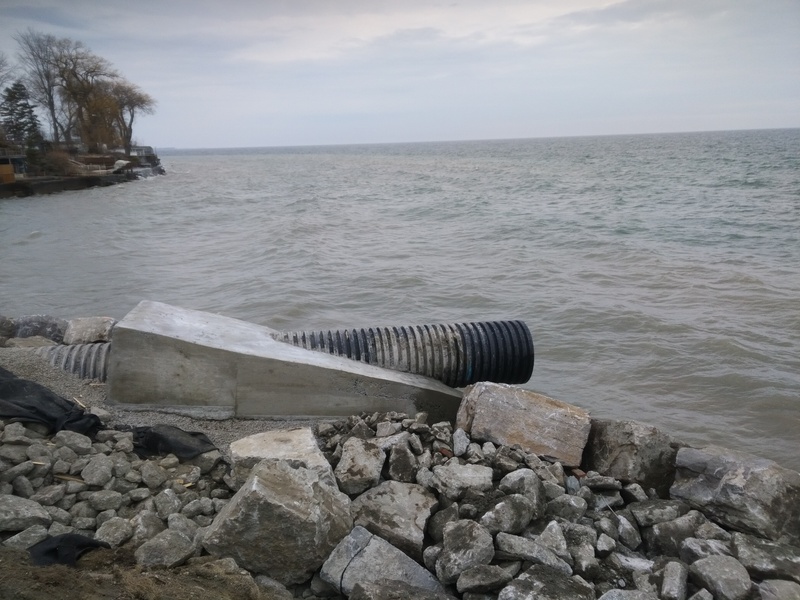 Integration of stormwater pipe into shoreline protection. The second pipe is visible near the black filter cloth. Source: TRCA, 2019. 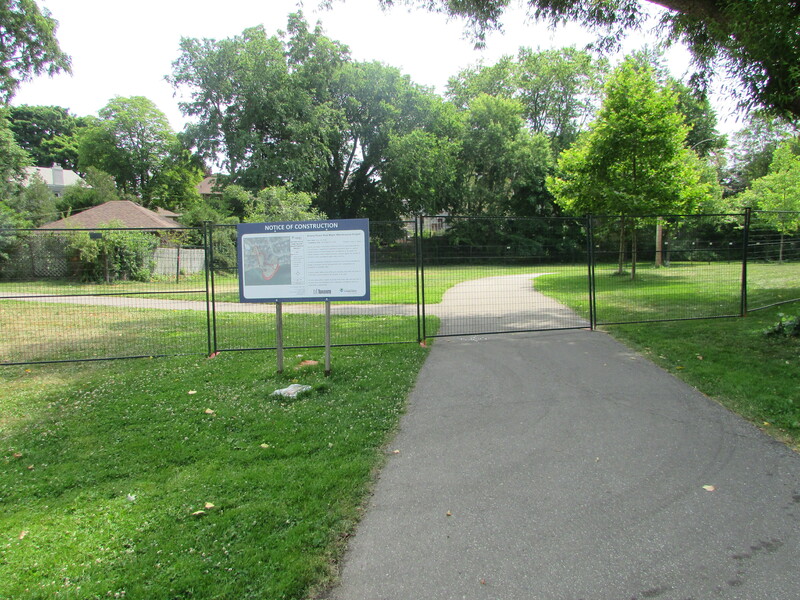 Armourstone placement along eastern portion of the park. Source: TRCA, 2019. The larger stormwater drainage has been refitted with a new pipe and a concrete casing has been installed to protect it. New drainage pipe outlet with concrete casing. Source: TRCA, 2019. All work below the water line has been completed. Crews will continue to place materials above the water line. In water works have been completed. Source: TRCA, 2019. 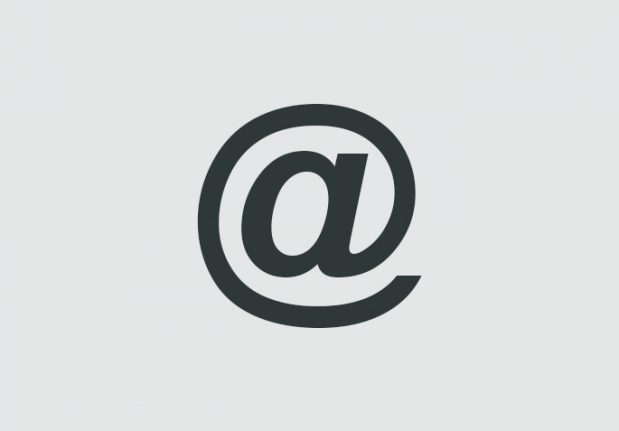 For more information regarding this project, please contact Jet Taylor, Project Manager.